Hygge; noun – a fundamental quality of Danish culture, Hygge cannot be translated using a single word. Rather, it includes many of the pleasures associated with everyday living – relaxing with friends, enjoying good food, and creating a cosy evening by lighting a candle or two. Total value of box = £115.66. Considering the box is £49.95 per quarter, you’re definitely getting good value for money. 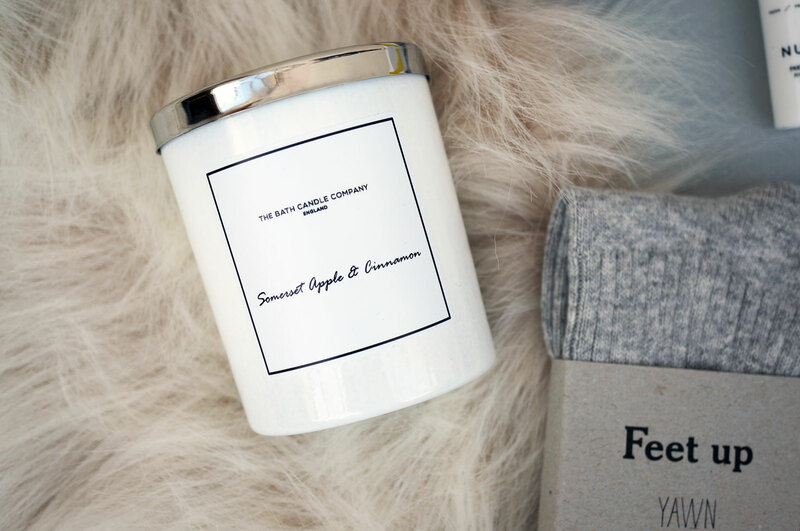 My favourite product in this box has to be The Bath Candle Company Candle – apart from looking super chic it also smells amazing! The scent is Somerset Apple & Cinnamon and it really smells to die for. I’ve just taken a look at their site and their other scents sound wonderful too. I think I’ll be popping their Orange & Chilli candle on my Christmas list! 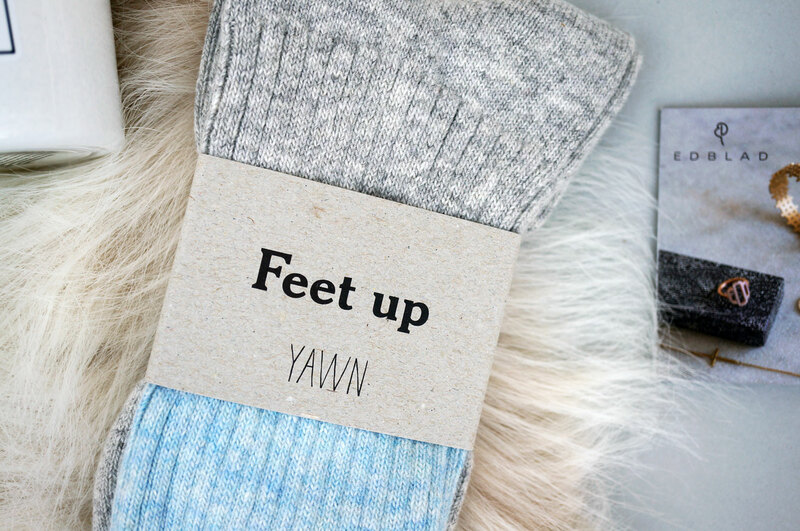 Next are the Cosy Sleep Socks from Love Yawn. These socks are wonderfully soft and include a small amount of cashmere in the material, to give an element of luxury and comfort. Now the weather has gotten colder I’ve been wearing them in bed, and my toes have been super toasty and warm. 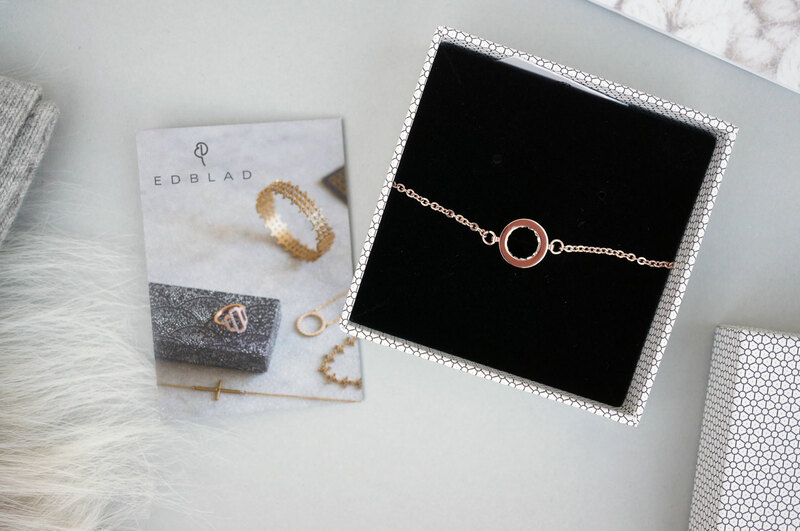 I was really surprised to find a gorgeous bracelet in the box – this gorgeous Monaco Bracelet from Edblad of Stockholm is just so delicate and pretty – and even if it’s not your style, it would make a fabulous Christmas gift. 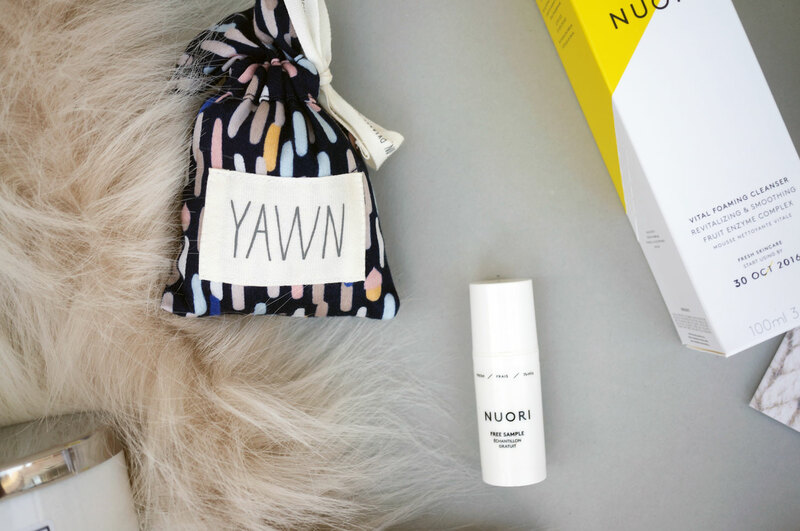 There’s also a couple of skincare products in the box from Nuori. I haven’t heard of this brand before so looked them up and found out that they are in fact Danish, which of course goes nicely with the Hygge theme. What makes them different to every other skincare brand is they make small batches of products every 12 weeks – therefore each product is fresh and includes less additives and preservatives thank your average skincare. You can read more about them here. 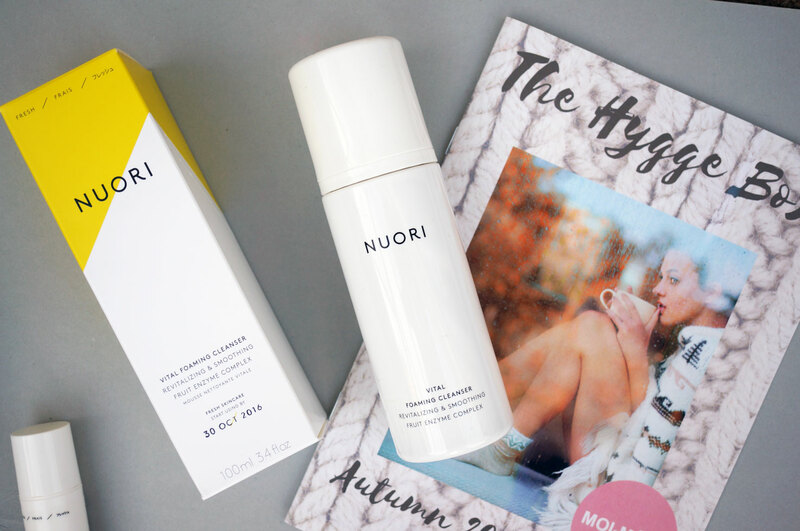 Their Vital Foaming Cleanser is a luxuriously creamy cleanser that removed makeup and impurities without stripping the skin of its natural oils, and the Vital Eye Cream sample is a lightweight eye cream that promises to hydrate the eye area whilst reducing the signs of ageing. And lastly the Rainy Days Lavender Bag from Love Yawn. This super cute fabric bag is filled with fragrant lavender, which is known for its calming and relaxing effects. You can with put this under your pillow to help you get a good night’s sleep, or throw in a drawer to keep your clothes smelling fresh. I’m really impressed with the Moi-Meme Hygge Box – though it is on the expensive side, the products included are of fantastic quality, and it’s also worth remembering that this box is quarterly – which (when you consider shipping costs) makes it a similar cost to most monthly beauty boxes when you add up the price over a quarter. The Hygge box was so popular that unsurprisingly it has now sold out. So if you think this looks good and fancy signing up for Moi-Meme’s next box – if you subscribe before December 31st you will receive your first box in January. 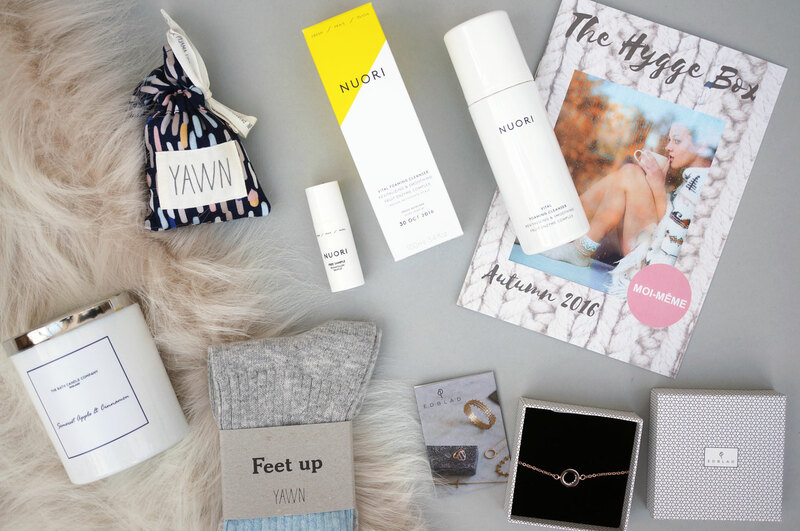 I should mention however, that most of the items from the Hygge box are still available to buy individually in the Moi-Meme shop, so definitely check that out if you like the look of these products.